TAKE IT WITH YOU: Keep your gear safe and protected with the trademark Spyder lockable watertight front cargo space, plus two side compartments, a rear compartment, and a glove box for a total of 41 gallons (155 L) of cargo capacity. COMFORTABLE AS YOUR COUCH: A premium saddle with lumbar support and passenger backrest provides maximum comfort during long journeys. Ready to accommodate the driver backrest (sold as an accessory). CHANGE WITH THE WEATHER: Activate the cruise control, then sit back and enjoy the scenery. Thermal rider grips keep your hands warm, while an electric adjustable windshield enables you to quickly react to changing weather conditions. ON-ROAD ENTERTAINMENT: Enjoy the full benefits of an AM/FM audio system and weather band that is also satellite-radio-ready. Rear speakers with independent audio control let you spoil your passenger even more. 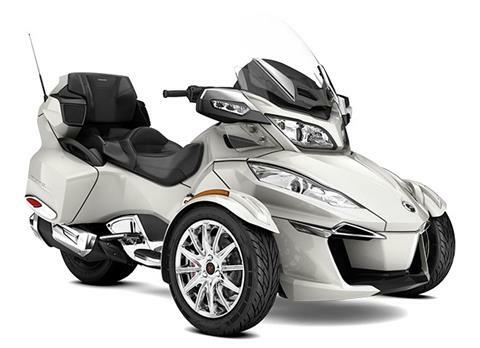 ROAD TRIP READY: This Can-Am Spyder model is ready to pull a Freedom trailer to take along everything you need. It includes a plug-in module that adds a trailer mode to the Vehicle Stability System (VSS). This ensures you get the same peace-of-mind riding with the trailer as you do without it.